One Hot Lap: Ross Bentley's Instructor Series: #1 - What’s It All About? Ross Bentley's Instructor Series: #1 - What’s It All About? I am thrilled to share that world famous performance coach, race car driver, author, and speaker Ross Bentley has put together a series of instructor-focused articles exclusively for OneHotLap. Here is Part I in the series. #1 - What’s It All About? I like to use the accompanying graph to illustrate a critical point about instructing. Looking at your effectiveness as an instructor over time, you will remember when you were first asked to be an instructor. I’ll bet one of your initial thoughts was, “Me? But I don’t know much. I don’t know enough to be an instructor.” That’s a good thing, because with this attitude, you learn. Your mind is open and you’re learning to be a better instructor. Most importantly, with this attitude, your students learn. After a little while you start to get the hang of instructing, you learn some specific instructing techniques that work (for most instructors, you learn this through trial and error, and perhaps by hearing some war stories from the old-timers), and you become even more effective at helping your students learn. Then (and it’s true of every single instructor I’ve ever seen – and I’ve seen thousands of them), you’ll then go through a stage where you think, “I’ve got this nailed. I’m really good at this. I’m a great instructor. Just listen to me talk to my students – I sound like an expert, because I am one.” It’s this attitude that will make you less effective at helping your students. At this point, your ego has become more important than your students. At this phase, you’ve learned many, many techniques and how to explain different driving skills in many different ways; you have deeper insights into what it is you do when driving and figured out how to adapt to your students, and so much more. And yet, you realize there is much more to learn; it’s at this stage where you are the most effective in helping your students. Take a good look at the accompanying graph, make note of where you’re currently at and especially who it’s all about. If you’re in the “It’s about me” phase, your goal is to get to the “It’s about my student” phase a soon as possible, knowing that some of it comes with experience that you can’t unnaturally speed up. 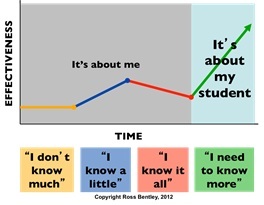 Be patient, focus on your student, and be aware of where you are on the graph. Fabulous article. It's helpful to instructors of course. But even more to those instructed. Thank you for posting it. Spot on, Gary. This is one of the most enlightening articles I've seen recently. So many instructors I've met seem to have fallen in a rut, do not prepare for each event and take themselves way too serioisly instead of working to understand the student. Ross really hits the nail on the head here.